James Tytler was born in 1745, son of the minister at Fearn in Angus, and after a good education at the parish school, and two or three years as a surgeon’s apprentice in Forfar, he made his way to Edinburgh to study medicine at the University. The following summer, 1765, he took service aboard the Royal Bounty, a Leith whaler, as ship’s surgeon. Then came the first of many misfortunes during his life – he got married. The marriage was hasty and he now had to earn enough to support his wife, making the continuance of his studies impossible. He set up business in Leith as a pharmacist. Business was poor, eventually forcing him to flee to England, out of the reach of his creditors. He returned to Edinburgh, now with five children as well, and set about making a living from what seemed to be his greatest skill - writing. He was a very prolific writer and editor, although the vast majority of his work went anonymously, being employed in the main by other writers and publishers. He is renowned to have had an amazing skill at editing, being able to précis an item as quickly as most people could read it. After some attempts at his own publications, a spell in the debtors' sanctuary at Holyrood, and his wife leaving him, he eventually found steady employment in editing the second edition of the Encyclopaedia Britannica, much underpaid at sixteen shillings a week. He spent the next six or seven years at this monumental work while living at Duddingston, using an upturned tub as a writing desk. The Encyclopaedia filled over 9,000 pages and it was during his researches for one of the appendices, covering Air Balloons and their development in the past year, that his interest was sparked. He set about constructing his Grand Edinburgh Fire Balloon with very little money and probably even less public support. He charged 6d to see a model, and eventually had his balloon ready for a public inflation, though not for a flight. At the time Edinburgh had a building nicknamed "the largest pigeon-house in Europe" - the partly built Register House at the East End of Princes Street. This made an excellent venue for Tytler to test his 40 foot tall balloon, the unfinished dome providing shelter and support. James Tytler then advertised the public ascent, to be held at Comely Garden (a pleasure garden, now * the site of Milton Street, Waverley Park, and the Elsie Inglis Hospital) on 6 August 1784. Needless to say, James had his normal luck - bad luck - all his attempts being dogged by either technical problems or the weather. The press attacked him, and the mob attacked his balloon. Discouraged but not beaten, he was ready again towards the end of the month. On Wednesday 25 August he inflated the balloon at an early hour in the morning, left the fire burning for another hour, stepped into his basket, and was released. The Grand Edinburgh Fire Balloon rose from the ground, tethered. 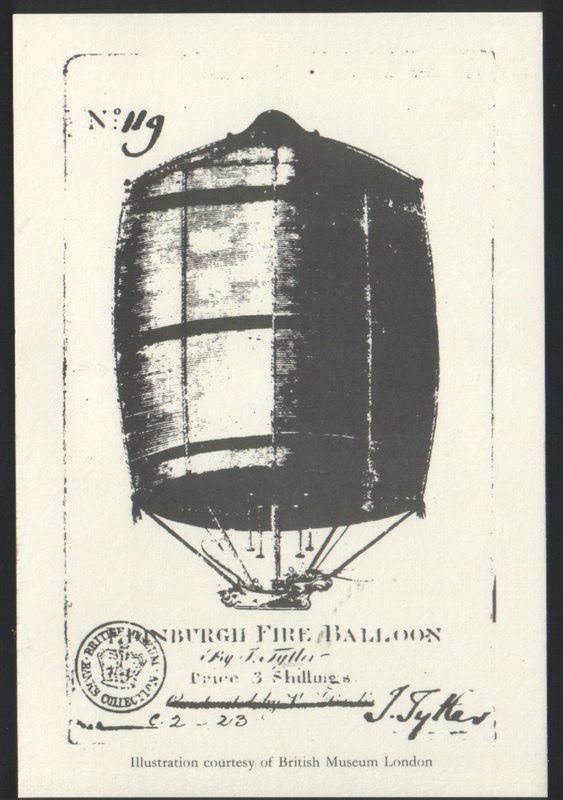 According to the Edinburgh Evening Courant "the balloon, together with the projector himself, and basket in which he sat, were fairly floated". Two days later he had even greater success, "navigating the atmosphere" for about half a mile to Restalrig, and on the 31st he made another ascent. Thus were made the first flights from British soil, predating both Lunardi and Sadler. Tytler was famous. A hero. Until another attempt failed and the ignorant press again criticised him. James Tytler's life after his ballooning successes was no less interesting, with another stay in the Holyrood sanctuary, further writing and publishing, divorce proceedings, another wife and more children, and eventually an indictment for seditious libel which led to his being outlawed. His last few years were spent in Salem, Mass., where he died in 1804. 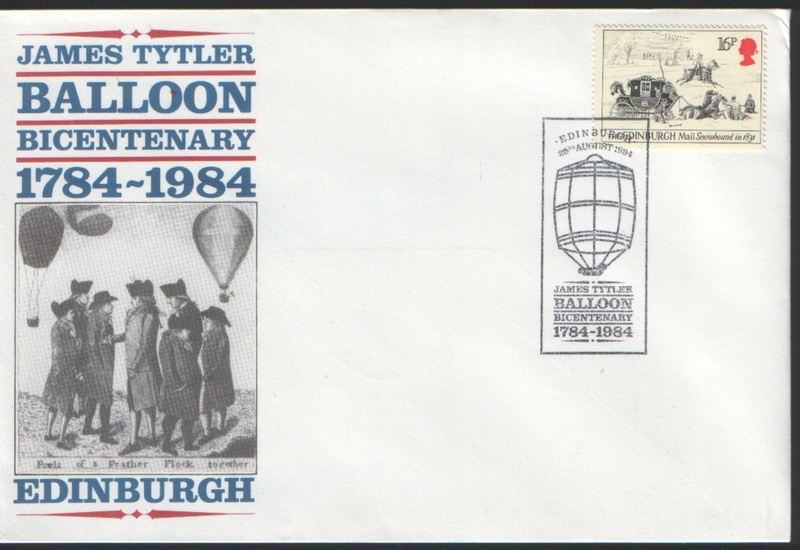 For the whole story, you are referred to Balloon Tytler by Sir James Fergusson of Kilkerran, London, 1972. Robert Murray, 1984, transferred to web page 2006. * Note that this article was originally written in 1984, since when the Elsie Inglis has been demolished, now replaced by houses, with the appropriate steet names of Tytler Gardens and Tytler Court. Some of the background to the political situation at the time, and Tytler's involvement with Thomas Muir et al. Airletter produced by Royal Mail in 1984. "Tytler's Up !" - a tune. (with the briefest of notes about Tytler's musical activities). 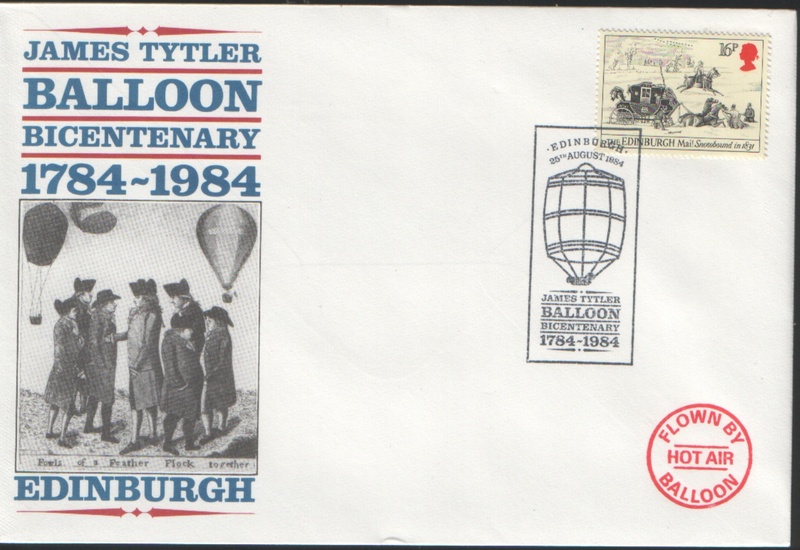 Souvenir covers produced in 1984 for the Bicentenary events. The main event was a weekend of hot-air balloon flights from Holyrood Park. A highlight was the appearance of the Edinburgh University Hot Air Balloon Club's new balloon named The Grand Edinburgh Fire Balloon. Souvenir cover for 25 August 1984. Souvenir cover for 26 August 1984. 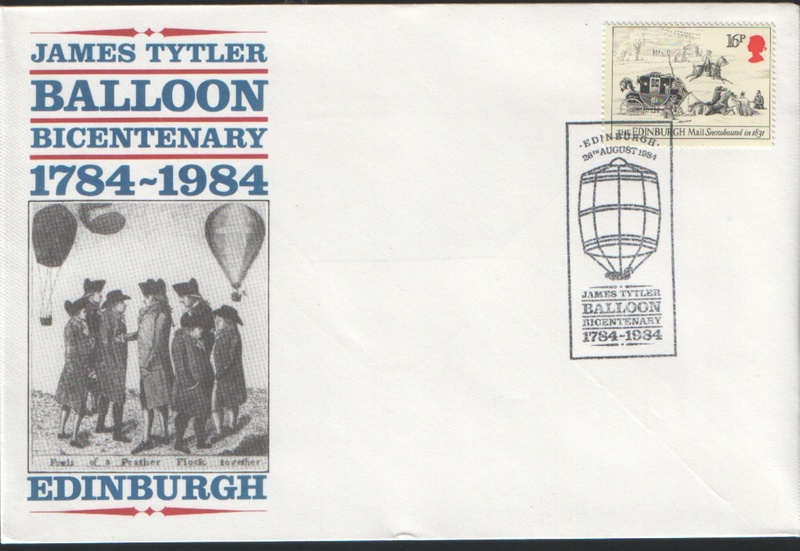 Souvenir cover for 25 August 1984, carried on special balloon flight (500 carried, individually numbered). Price £5.00 (how to order) Filler Card, as enclosed in all types of souvenir cover. (and maybe also the High Street for some period atmosphere, and a drink to toast his memory !). See a map of this route here (new window) (excellent by bike, or as a decent walk, approx. 8km).